Are you unhappy with the appearance of your smile? Perhaps you have a prominent chip or crack or perhaps your smile has become permanently discoloured. Dental bonding, also known as composite bonding, is a cosmetic dentistry treatment used to repair the appearance of teeth. Dental bonding can treat the appearance of discoloured, chipped or cracked teeth. It is also a popular option for replacing amalgam (silver) fillings as well as to close gaps between teeth, reshape misaligned teeth and provide a straighter, more unified smile. As far as cosmetic dentistry goes, bonding is the most conservative treatment. There is little alteration to your natural tooth structure and the treatment is reversible providing none of the tooth enamel is removed. The immediate results of dental bonding are seen by many patients as its main benefit. The other benefit is that the material used for dental bonding can be matched to the shade and colour of your natural teeth. This means, when you rejuvenate your smile with dental bonding, the restoration will look subtle and natural. When you visit Duck Creek Dentaldental, we will first assess your oral health and determine the best way to treat your oral condition. Prior to treatment, if you have an oral health issue such as gum disease this must first be treated. If you are in good dental health, a local anaesthetic will be administered. Generally speaking, dental bonding does not require anaesthesia. In order to keep your tooth dry a rubber dam will be placed around it to prevent saliva interfering with the treatment. After your tooth is thoroughly cleaning of all decay, food debris and tartar, it will be prepared using a gel that roughens the surface of the tooth. A bonding agent is applied to the roughened surface and set using an ultraviolet light (similar to teeth whitening). The composite is then applied in layers and set at each stage. This process will be repeated until the desired shape is achieved. The last stage of this treatment is to polish the restoration to achieve the final shape and smooth finish. The entire procedure can be achieved in just one appointment. 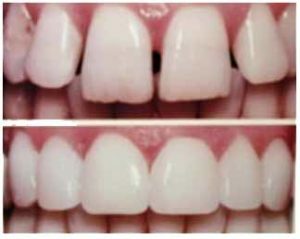 Bonding is a more conservative alternative to veneers, and while composite bonding may not last as long as veneers, results can be achieved in just one appointment. If you’re looking for a relatively quick, effective and aesthetically pleasing way to restore your smile, then dental bonding may be the answer. Talk to the team at Duck Creek Dental to find out how can help you.